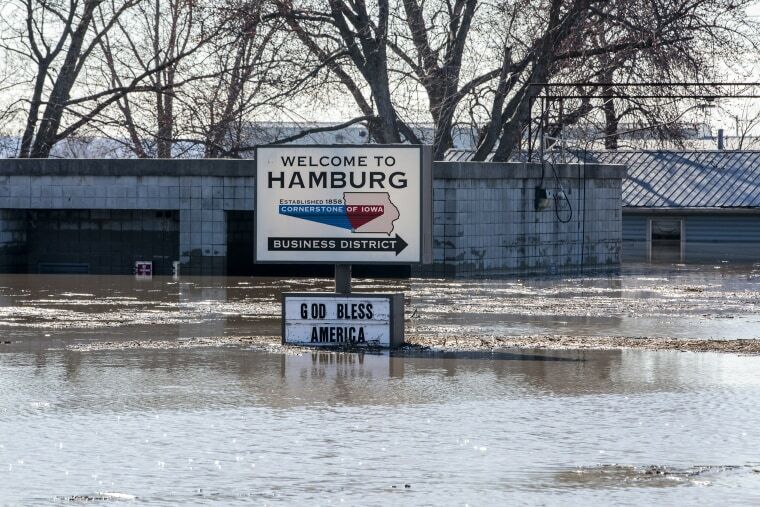 Late winter's deadly flooding could turn into catastrophic spring flooding in the Midwest and beyond, forecasters said. The National Oceanic and Atmospheric Administration's "spring outlook" issued Thursday came with dire warnings, even as flooding was already tormenting states including Nebraska, Iowa and Missouri. "More than 200 million people are at risk for flooding in their communities," Ed Clark, director of NOAA’s National Water Center in Tuscaloosa, Alabama, said in a statement. Three deaths from the Midwest flooding have been confirmed, and on Thursday, President Donald Trump approved Nebraska's request for federal disaster assistance. The Nebraska National Guard used helicopters Thursday to drop hay bales to feed cows stranded by floodwaters. Heavy rain supplemented by rapid snow melt has widened rivers and put farms underwater. But Mary C. Erickson, deputy director of National Weather Service, on Thursday warned that the trouble may just be beginning. "The major flooding we’ve already experienced across the lower Missouri [River region] and the lower to middle Mississippi [River] valley is a preview to what we expect the rest of the spring," she said. "In fact, we expect the flooding will get worse and become more widespread." The outlook states that spring, which this year concludes on June 20, could bring major or moderate flooding in 25 states, with at least two-thirds of the continental United States expected to see an "elevated" flood risk and above-average precipitation. "Additional spring rain and melting snow will prolong and expand flooding, especially in the central and southern U.S.," the federal outlook reads. "As this excess water flows downstream through the river basins, the flood threat will become worse and geographically more widespread." Erickson said flooding could stretch into May. "The communities in the high-risk threat areas need to prepare for impacts as the floodwaters move down the river system," she said. Jack Boston, senior meteorologist at AccuWeather, said the private forecaster has a similar outlook for spring, with most of the flooding in Missouri and Mississippi river regions likely occurring in April. With as much as 19 inches of snow on the ground in parts of the Dakotas and a lot of snow remaining in western Minnesota, the situation doesn't bode well, he said: "All that snow has to melt." California and Colorado mountains also have above-normal snow pack that has been boosted by a weak El Niño weather condition in the Pacific, he said. That could contribute to spring avalanches, Boston said.